Your Car Battery & Auto Electrics Specialists in Rockhampton. | Know Early Signs of Battery Failure Battery & Auto Electrical Quick Links | Battery sales | Car Battery Test, Repair Replacement. Feel safe with a Delkor battery, built stronger and lasts three times longer. Delkor batteries are built with unique ingredients, making them highly resistant to corrosion. They also have the lowest self discharge rate therefore making them the maintenance-free car battery that last up to 3 times longer. 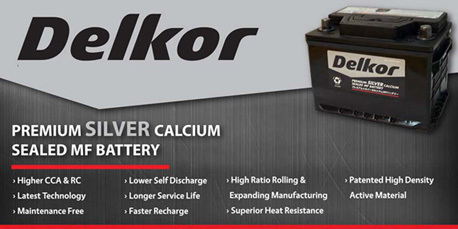 Delkor AGM Batteries are the premium choice for high-end and advanced fuel-efficient vehicles with high electrical demands. This innovative technology offers up to three times the life of a standard flooded battery and superior performance over the life of the battery. AGM batteries are extremely resistant to vibration, are totally sealed, non-spillable and maintenance-free. AGM offers better cycling performance, minimal gassing and acid leakage when compared with conventional lead-acid batteries. The special absorbent glass mat lead-acid (AGM) soaks up all the acid in the battery, providing high cyclic stability. EFB batteries support applications that operate at a partial state of charge and don’t require the deep-cycling characteristics of an AGM battery. A polyfleece scrim material added to the positive plate surface makes this possible. This helps to stabilise the active material of the plates, which increases the endurance. Delkor Long Life Premium Silver Battery, Best Value For Money. THE ADDED BENEFIT of using a lead-calcium-silver alloy that elevates performance and durability for extreme applications or high temperatures. Unparalleled choice for car enthusiasts and prestige car owners. Unique lead-calcium alloy produces a heavy-duty wrought plate that is able to withstand the most arduous conditions. Suitable for the majority of consumer vehicles. There are major and minor services. A minor service is usually a change of oil and filters, plus a check that everything is operating as it should. A major service is more comprehensive and, naturally, more expensive. Major services are usually scheduled at 60,000 km intervals. Minor services should be undertaken every 10,000 or no later than 15,000 km. The most important thing to do is to refer to your owner’s manual. Some manufacturers require six-monthly services, effectively doubling the cost (and if you ignore the recommendations, you void your warranty, so make sure you check it out). Log Book Services Site Link or maybe a custom servicing plan would better suite your usage pattern Custom Services Page Link. Complete Listing of EVERY ONE OF OUR SERVICES.